Scoliosis, which is spinal fusion surgery, is performed mostly on children only if they meet a certain degree of curvature in their spine. Officially, Scoliosis is defined as an abnormal lateral (side to side, as opposed to forward or backward) curvature of the spine. Yet a standard medical definition only tells half the story when it comes to this sometimes devastating condition that can affect both adults and adolescents. When it comes to scoliosis, the average age of curve acceleration stands at 11.7 years. (Maturity assessment & curve progression in girls with IS, JBJS 2007) Girls are more frequently affected by boys, and those with a family history of scoliosis are more likely to suffer from this condition. When the spinal curvature fails to exceed 20 degrees, scoliosis surgery might not be needed. In instances where the curvature does exceed 25-30 degrees, the patient might need to undergo scoliosis surgery or even a back brace to address their condition. With the robotic technology that New Era Spine possesses, a Scoliosis procedure is much safer and reliable than in past years. When someone’s vertebrae does not develop properly, then they may be born with congenital scoliosis. This is generally diagnosed at three stages: Infantile, juvenile and adolescent. Idiopathic: The most common form of scoliosis, particularly in women and girls, has no known origins, with no overall abnormalities in the bone structure. Neuromuscular: Those with nervous system diseases, like cerebral palsy, suffer from this form of the condition. Postural: Sometimes back pain will cause a misalignment of the spine; one that could not be classified as a deformity. Syndromic: This variety strikes patients with Marfan syndrome and other ailments. Surgery to treat Scoliosis today is safer and patients achieve much better results than ever before, and all treatment outcomes and results are specific to the individual patient. Any surgery, especially surgery performed on the spine, close to the spinal cord, has risks. Issues that can arise are infection, bowel/bladder problems, nerve damage, and significant blood loss are risks associated with any spinal fusion surgery, which is the scoliosis surgery procedure. Other issues associated with treating scoliosis include botched surgery (failed surgery), loss of proper spinal balance, complications with the healing of the newly set spine (pseudoarthrosis), instrument failure and vertebral degeneration in the levels next to the fused section. Symptoms of Scoliosis include back pain, the appearance of imbalanced shoulders or hips (in which one side is higher than the other) or a shoulder blade protruding outward; in addition, a protruding or twisted rib cage may be indicative of this condition. A limitation of lung capacity and function also might in some cases be associated with this illness. Congenital: When someone’s vertebrae does not develop properly, then they may be born with congenital scoliosis. This is generally diagnosed at three stages: Infantile, juvenile and adolescent. Typically, spinal curvatures are detected by a doctor or by way of a scholastic screening. At that point doctors will monitor any changes that affect the spine as the patient grows. Once a sideways spinal curvature reaches 10 degrees, the condition of scoliosis is detected; although at this level, no symptoms or signs of deformity typically present themselves. As the curve advances beyond 20 degrees, the body might tilt to one side–making one’s shirts appear uneven across their shoulders. Although idiopathic scoliosis is not typically painful, it can elicit muscle spasms, joint misalignments, and bodily imbalance; thus negatively affecting one’s posture and range of motion. Traditionally, scoliosis causes have been hard to determine. There is a larger increase in having it based on hereditary factors, as the spine disorder tends to run in families. For those without hereditary Scoliosis, finding a connected cause has proven itself to be a challenging research topic for doctors. Children with poor posture, have uneven gates, and those that tend to sleep on their stomachs have an increased risk. The severity level of Scoliosis that a person has may be described as ‘the scoliosis spectrum.’ Its causes are unclear, although in certain cases scoliosis can be traced to illnesses like cerebral palsy and muscular dystrophy. And while most instances are relatively mild in terms of their symptoms and effects, some extreme cases of Treatment can result in deformities, disabilities, and even breathing difficulties; this owing to the fact that a serious spinal curve can limit the quantity of available space inside the chest, thus impairing lung function. When organs are impaired from functioning correctly, scoliosis surgery is necessary. When Scoliosis has been diagnosed at a spinal curvature of less than 25 degrees, then X-rays should be taken every 4 to 6 months to check the disease’s progress. 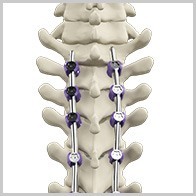 If the curvature advances past 20 or 25 degrees, back bracing is usually the first recommended course of treatment. A back brace is worn during the patient’s complete skeletal development until they turn 18. The object of this treatment is to limit the disease’s progress and avoid surgery. In mild cases, surgery may not be needed. If the condition becomes more severe as determined by x-rays and enhanced physical symptoms, medical treatment should be considered. Corrective surgery might be considered as an option, especially posterior spinal fusion, which provides enhanced corrections with fewer fusions and–in the end–greater back mobility. Surgery that involves the pinning of the spine is another option, with the pins anchoring a rod that straightens and holds the spine curvature in place. If this condition is addressed early in life, then additional problems can be avoided later. At New Era Spine, Dr. Payam Moazzaz works with each scoliosis patient to determine the best course of treatment on a case by case basis. Luckily, approximately 90 percent of these patients never need surgery or a neck brace. If you have scoliosis or suspect that you might suffer from this condition, your next step is a thorough consultation with a caring and experienced orthopedic spine specialist in the California area. Stand tall and seek relief from the misery of scoliosis. To book an appointment, please contact our office today.